Acrylic is the most durable form of nail enhancement. Recommended for those who constantly work with their hands. It is the most popular form of artificial nails due to its durability and low maintenance. Pink & White Pink & White Acrylic also called “Permanent French” or “Two Tone”. It is the most popular look among women. It is classic, clean, and natural, shiny, and ready to go without the wait of polish to dry or polish wearing off. The French tips dry instantly and stay shiny longer than polish. It’s non-yellowing formula is applied in a double process with white powder for the free edge and pink powder for the nail bed. 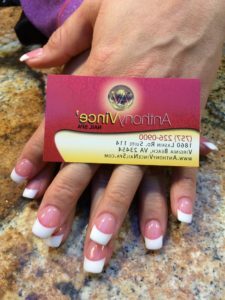 UV Gel is a lightweight and durable form of nail enhancement. It will keep nails shiny even without polish. Recommended for those who want a durable enhancement but do not like the look of acrylic nails. UV Gel has a more natural appearance. SNS is proven to improve nail growth. Having both beautiful and healthy nails, at the same time. Catch up on the hottest growing trend ! © 2019 Anthony and Vince.